Breaking bread together is one of the most fundamental things we can do as a family. I believe that the basis of a good community is in the family. It is the first place where we learn to behave as a group. I believe that the basics of interaction as a community are set at the dinner table. How to care, share, talk, communicate, support and so much more. Lifeskills such as food preparation, setting a table, sharing space, food and of course how to clean are all included in the simple action of breaking bread together. Be it as simple as putting butter on a slice of toast, or as making a dough and baking a bread, we are creating a learning environment that nurtures and nourishes our family. I’ve written before about the lack of empathy (particularly in social media) for families who don’t serve up nourishing meals from scratch. I do think it’s worth mentioning that there is more to the act of eating a meal than just serving up food. Dining together is a multi-faceted learning experience, that isn’t just about the meal that is eaten. There is huge value to be placed on a family that eats as one, with no distractions, that dedicates the time to create the learning environment no matter what is on the table. These foundations were well built in my home as I was growing up. Now when the extended family get together it is often around the table; we commune around food but it becomes so much more. Yesterday the toddler and I made focaccia together. It’s a sharing bread that I make every now and again; we had great craic and made a huge mess. When it was baked and a little cool we stood in the kitchen together, nipping crusty bits from the edges and delighting in the wondrous smell of freshly baked bread. We then scooped up our dinner with bread instead of using knives and forks. If you practise mindfulness, you’ll understand what I mean when I say yesterday was a day when I became rooted in the moment and relished the present. There are so many opportunities to do that in family life and I need to remember that more. Including the cost of running the oven, this loaf of bread should cost you €1.20 to make. Do bear in mind that it doesn’t take into account your time. I’ve used a premium strong white flour as I prefer the results, however you can get cheaper or even use plain cream flour which will result in a denser texture but it is perfectly edible! Put the flour, yeast and salt into a large bowl and stir loosely with a fork. Add the olive oil and mix in well until you get a very loose breadcrumb texture. Add 75ml of water (cold or room temperature is fine, don’t use warm) and mix into the flour. You’re aiming for a loose, wet dough. If you have a stand mixer make the most of the dough hook. If not, rub a little oil on your hands before mixing so that the dough doesn’t stick. Add the remaining water bit by bit. The dough is very loose and slack. Knead it well until smooth, this will take about 20 minutes by hand or 10 with a stand mixer. Grease a large bowl with some oil and put the dough inside, then cover the top with cling film. Leave the dough in a dark spot, not too warm, to rise for about 3 hours or so. It nearly needs to over-prove to get the irregular air bubbles when you bake it. Take a ceramic baking dish (mine is 20cm square), lightly oil it and dust with a little flour. Preheat a (fan) oven to 200 degrees Celsius. Gently turn the dough out of the bowl directly into the dish and use your knuckles to pad it into the corners, the knuckles will give it the lumpy surface. 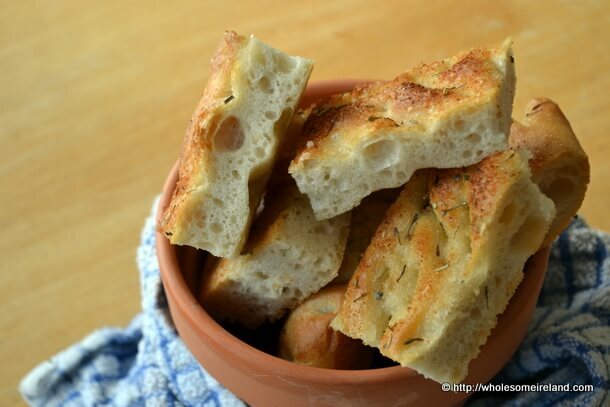 Sprinkle the top with dried herbs of your choice (I used rosemary and thyme and some dried garlic), then spoon a little olive oil over the herbs so that it pools in the shallow parts of the dough. Once the oven is up to temperature, bake the bread in the oven until golden brown on top. This should take about 25-30 minutes. Leave to cool in the dish for at least 15 minutes before turning out onto a cooling rack. Ah jumping up and down to get stuff all becomes part of the “learning to provide & care for” category. I mean more of the mobile phone/games/tv kind distractions. You are doing great! Lovely smell of baking bread wafting up from the page. So important not to worry about mess in the kitchen when children are small – the skills, the sharing and the fun will stand to them all their lives but many people don’t cook with their children because of the cleaning up. That fills me with so much sadness. The mess you can clean, the experience you can’t replace. 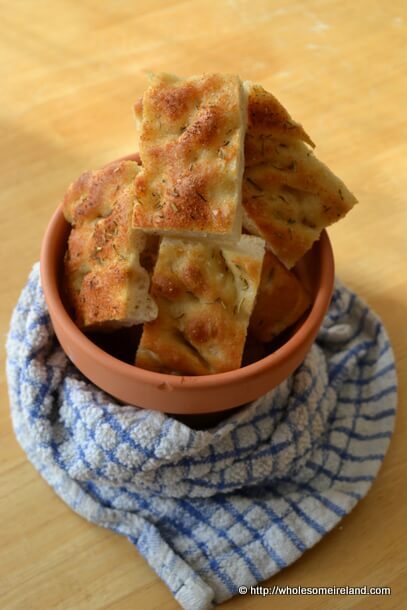 I make focaccia all the time! I love how quick and easy it is… I’m going to try this recipe right away! 🙂 I make holes in mine and push in sprigs of fresh rosemary from the garden.